I only needed one weekend In New Orleans’ irresistible French Quarter to nearly spend $200.00 in small gratuities. Solo street musicians, bands, jugglers, human statues (witness Bourbon Street’s hard-hatted construction worker, posing motionless on his ladder while holding a two-by-four over one shoulder for hours on end), hip-hop dancers and hucksters - the last group offering more in the way of desperation than talent – all had their hand-in for a hand-out By the time Saturday night rolled around, when Sue, (my traveling companion), and I observed a roach crawling across the very old bar at The Spotted Cat on Frenchmen Street , I didn’t know whether to kill it - or tip it. 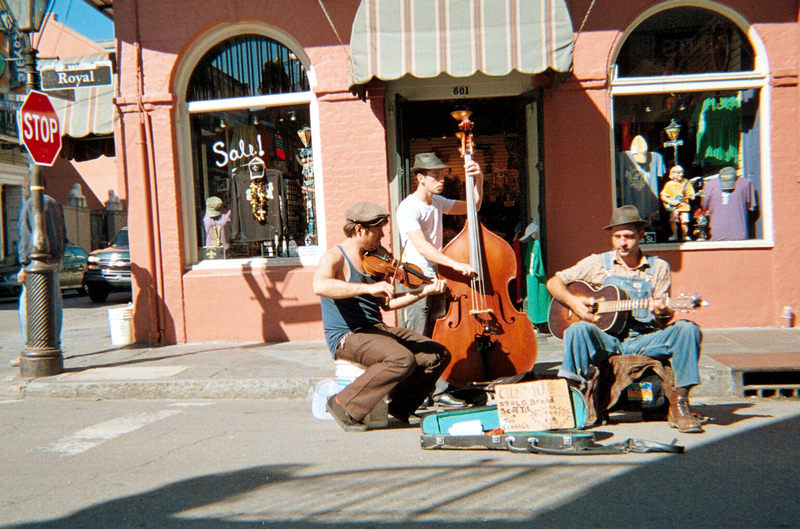 But for me, New Orleans has always been about the music. And if the Dixieland revival of the 1940s began a touristy homogenization of the music created by King Oliver, Louis Armstrong and Jelly Roll Morton in the first few decades of the 20th century, ultimately resulting in non-stop performances of “When The Saints Go Marching In” at Preservation Hall – and just about every place else in town - it’s still New Orleans. And I - like others early jazz aficionados - wouldn’t dream of not going. There are definitely two strata of musicians in New Orleans: those that are paid by salary or a percentage of the door cover (including headliners), and those that work exclusively for tips. 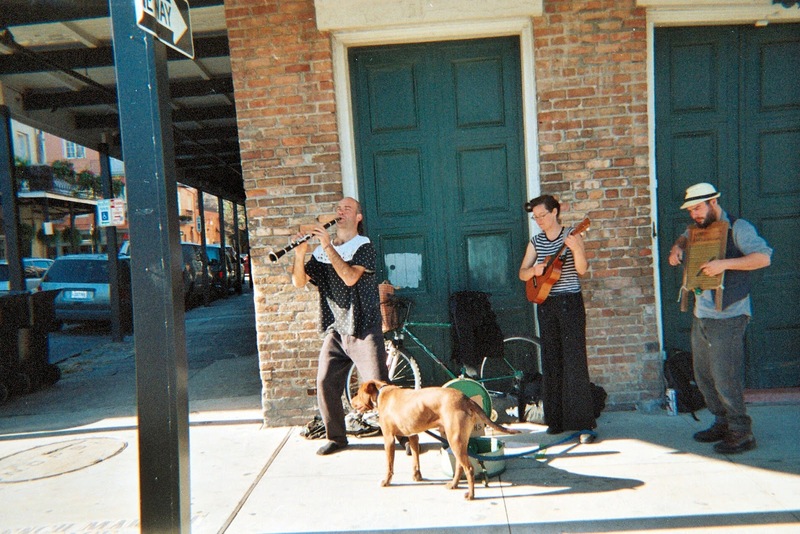 Of course, the street musicians, solely dependent on tips, are the most visible. They dress in clothes of an indeterminate, but somehow indigenously convincing, bygone era. Many groups bring along their pet dogs who either sleep or wag their tails in time to the music. Adapted plastic water jugs and instrument cases are open for tips, with hand lettered cardboard signs requesting $1.00 per photograph. Some try to imitate the virtues and limitations of the old New Orleans jazz and country-folk styles with varying degrees of success. At worst, they seem creatively trapped by it. At best, you can hear and feel - even from the very young players just past their teenage years - a genuine yearning to make it all new and relevant. Thanks to the digital age and the internet, a few of the street bands offer up inexpensive CDs. 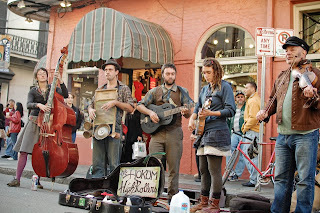 The polished and talented Hokum Highrollers, comprised of guitar, banjo, fiddle, string bass and trumpet can be viewed on www.facebook/thehokumhighrollers For their street concerts, they offer up an old-time, swinging, string-band sound, replete with southern vocal twangs and kazoo. Amanda Blake on trumpet (fighting off a cold when I saw here), employs an empty soda cup as a mute and tap dances; her metal taps (in addition to being entertaining), provide an inventive alternative to woodblocks or spoons. These guys really nailed the string band sound of the early 30s. 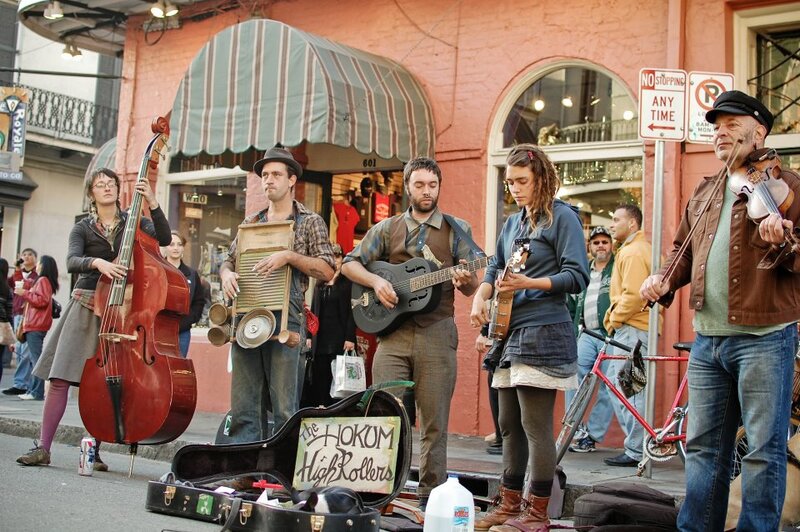 While the Hokum Highrollers are attempting to brand themselves, many street musicians move back and forth between pick-up groups. 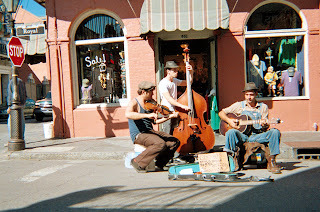 One afternoon I cited a country guitarist/singer in three different bands in the French Quarter. 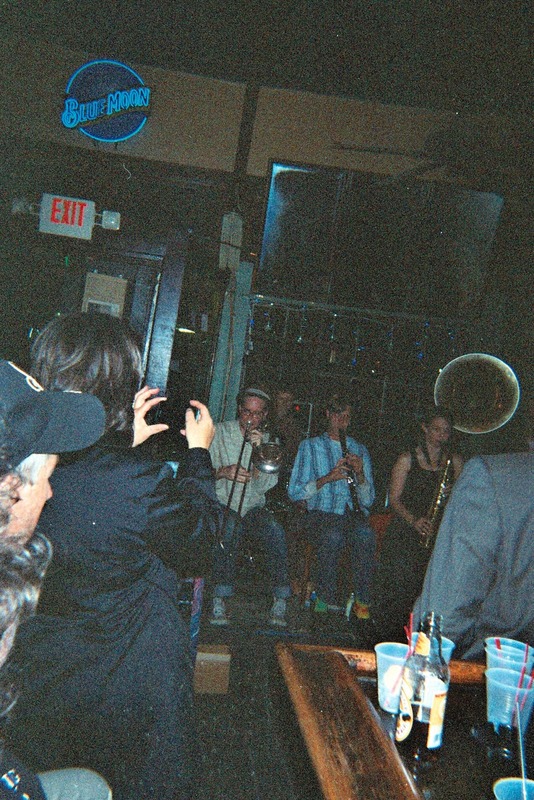 If you want to weave in and out of a very inexpensive and rewarding club scene, however, Frenchmen Street has numerous restaurants bars and clubs – all noted for their music, accessibility - and some for a delectable seasoning of sleaze. In just about any other city or town, The Spotted Cat is a bar that would have to be considered an old and unmitigated, mangy dive. But somehow, on Frenchmen Street - with its joyously maintained and seedy authenticity (and a portrait of my man, Jelly Roll, above the bar), I found it down-right exotic. For the price of a one-drink minimum, we were unexpectedly blown away by the Panorama Jazz Band. Comprised (on this night), of clarinet, sax, trombone, sousaphone, accordion and drums, the ensemble brilliantly played inventive and tight arrangements of an eclectic series of jazz and Klezmer inflected tangos, waltzes, horas, and marches. Once I heard this group, I had absolutely no desire to move on to other destinations. But despite my experience over the last two days – and given the quality of their performance – I was still surprised when the sousaphone player, Jon Gross (recently nominated by Offbeat Magazine for “Best Tuba/Sousaphonist” in New Orleans, who’s maybe 5’7” tall), stepped off the stand in the middle of a tune, and waded through the customers, soliciting tips – still performing - and without dropping a single note or beat. Playing the horn’s valves with his right hand, he held the ubiquitous plastic gallon water bottle aloft with his left - secured by his three middle fingers - while managing to hold two different CDs between his thumb and index fingers. Was I impressed? Let’s just say I wasted no time in taking a CD and dropping a twenty into the plastic bottle. In talking with the trombonist, I learned the band seldom played outside of New Orleans – which somehow, was just what I wanted to hear. The Panorama Jazz Band rounded out the short stay beautifully. My final musical, New Orleans tip-touch-point before heading back to Jersey. This unknown clarinetist really wailed. But wouldn’t you know it: as it turns out The Hokum Highrollers hail from Burlington, Vermont.